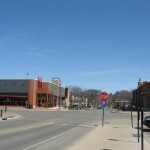 Known primarily for being the state capital as well as home to the flagship campus of the University of Wisconsin, Madison is the second largest city in the state and a burgeoning little metropolis of over 500,000 people. A leading research university and one of the top-tier public institutions of higher learning, UW-Madison has infused the city with a progressively laid-back culture and a wealth of diversity. They even gave me a degree! 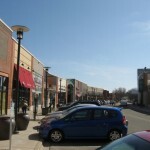 Both the University, the industry it spawns, and state government offices have kept Madison a highly educated, tightly knit, self-aware cosmopolitan city which is often referred to as ’85 square miles surrounded by reality’. 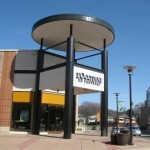 Opened in 1962 on what was then the western edge of Madison, Hilldale Shopping Center has had a unique and intriguing history. 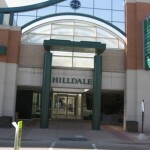 Hilldale was one of the first major shopping centers in town, and it’s also one of the closest malls to where I live. 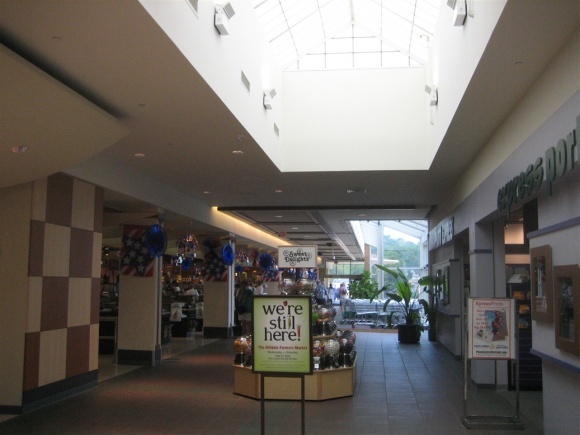 The thing about Hilldale is that it falls under the radar – it’s not a traditional mall in any sense of the word, and never really was. 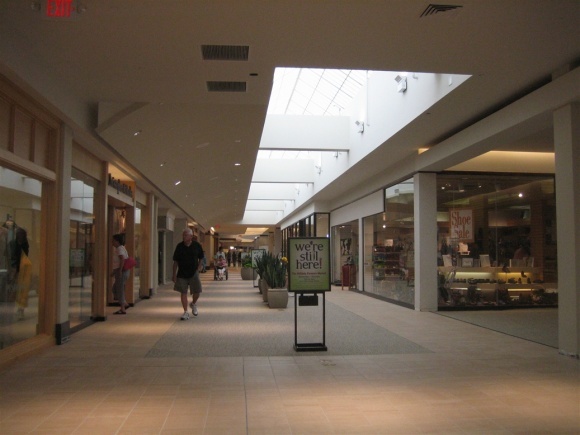 Through the decades Hilldale has undergone some major changes and has continued to reinvent itself by eschewing shopping center norms, and, reflective of its status as an institution in this weird city I live in, remains as viable as ever. 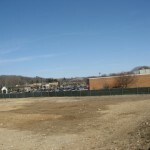 Before construction, the land where Hilldale sits was – surprise! – a farm. 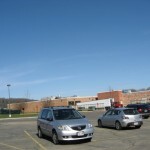 It was called Hill Farms, and was owned by the University’s School of Agriculture. In the early 1950s, as Madison expanded, its edge of development rapidly reached Hill Farms, gobbling up farmland left and right all around it. The neighborhoods being built on the near west side of Madison were mostly residential and nicer than average – today as then, this part of Madison is home to older yet tasteful and expensive homes, housing many professors, doctors, and other professionals. Not wanting to stand in the way of progress, and looking to make a tidy profit in the process, the University decided to develop Hill Farms into a cute little 1950s planned suburb. 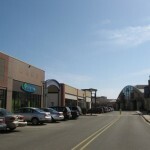 The focal point of this new development was to be Madison’s first large-scale shopping center, located on 33 acres of land at the corner of Midvale Boulevard and University Avenue, which was then US Highways 12 and 14. 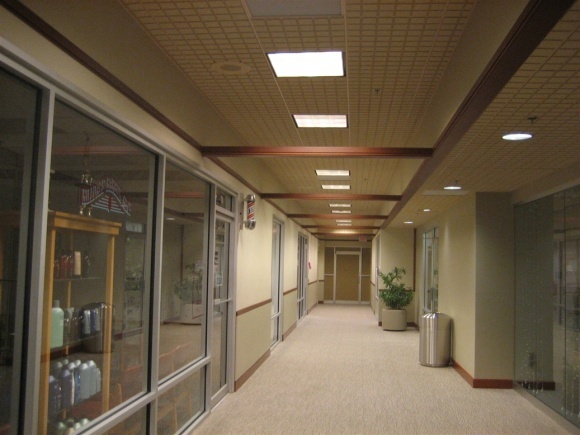 In addition, housing, offices and other townsy facets were to be thrown in the mix, with the ideal of a totally self-contained community a goal. 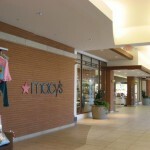 Using their lawyer, the University determined the best way to go about this was to create a dummy corporation, Kelab Inc., to deal with the mall and other buildings constructed in the development. 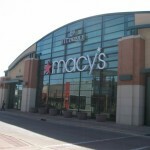 The dummy corporation would serve as a bridge between the mall and the University, collecting the mall’s rent and passing it along. 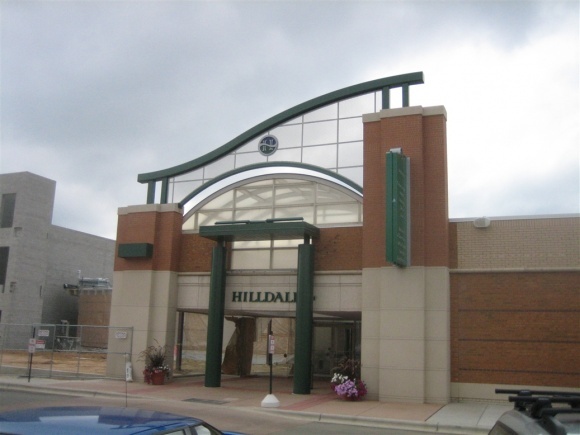 This undertaking apparently inspired controversy, and it wasn’t long before Hilldale was wrangled into the first of several legal struggles in its history, which occurred years before the center even opened. 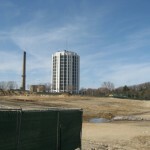 It pitted the Hill Farms developer, the University, against other developers who felt that the University – a hand of state government – shouldn’t be in the business of profiteering. After years in courts, the U.S. Supreme Court made the final refusal for appeals, ruling in favor of the University, and the project finally continued on its merry way. 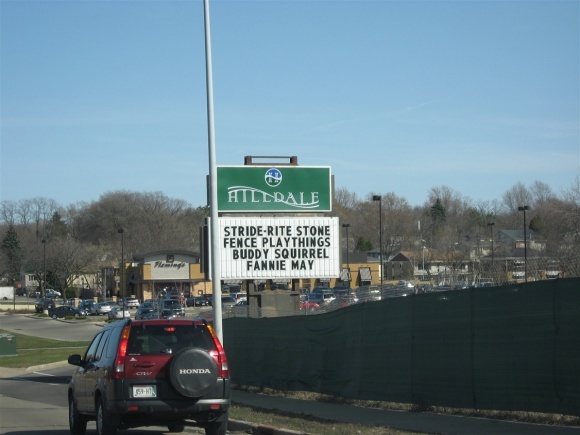 Meanwhile, Westgate Mall opened just a few miles away in 1960, stealing Hilldale’s thunder for first shopping center in Madison. 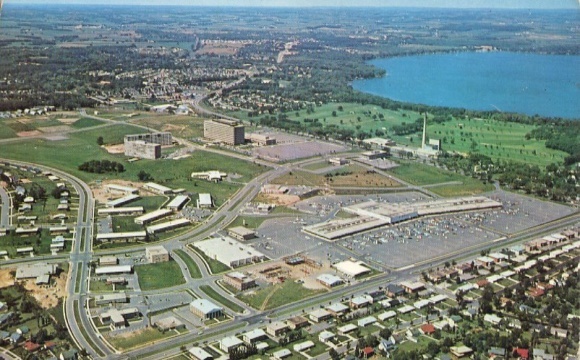 Once the legal issues were resolved, Hilldale finally broke ground in 1961 and opened October 25, 1962. 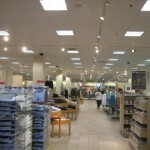 It was anchored by Milwaukee-based Schuster’s department store, which was flanked on both sides by a row of stores. 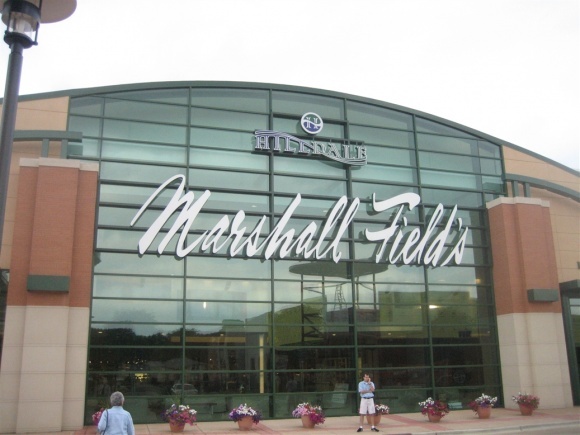 However, about the same time Hilldale opened Schuster’s was purchased by a Milwaukee/New York-based store of a more familiar name, Gimbels, and was renamed Gimbels-Schusters before finally just becoming Gimbels. 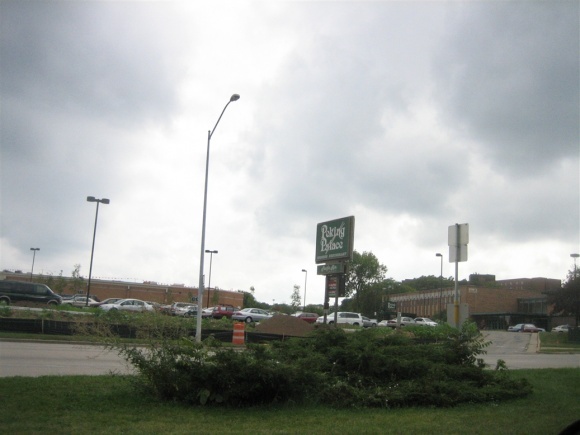 Other Madison originals such as Yost-Kessenich’s and Wolff Kubly also located here, as did Walgreens and an A&P supermarket. 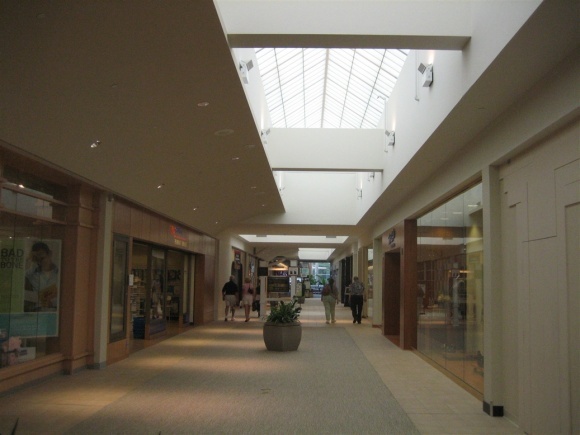 In 1968-1969, Hilldale renovated and expanded, fully enclosing the mall. 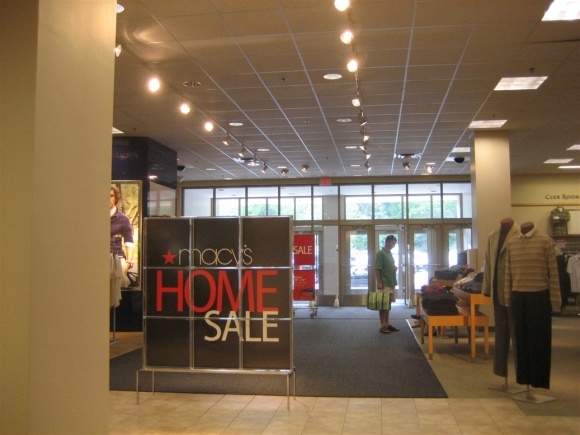 In 1971, Gimbels doubled the size of its store here, at the same time it opened another large store in Madison’s East Towne Mall. 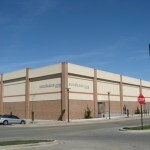 In 1975, A&P left Madison and the supermarket became a Milwaukee-based Sentry Foods, an affiliation it would hold until 2010 when it dropped the affiliation, becoming Metcalfe’s Market. 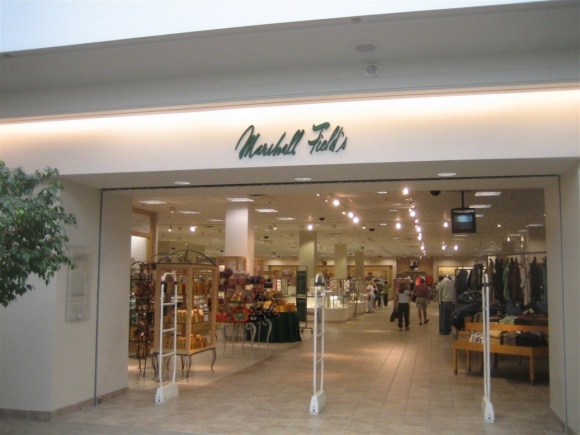 Following the Gimbels purchase, Marshall Field’s did some restructuring a few years later, and some adjustments were made to keep the brand both upscale and profitable. 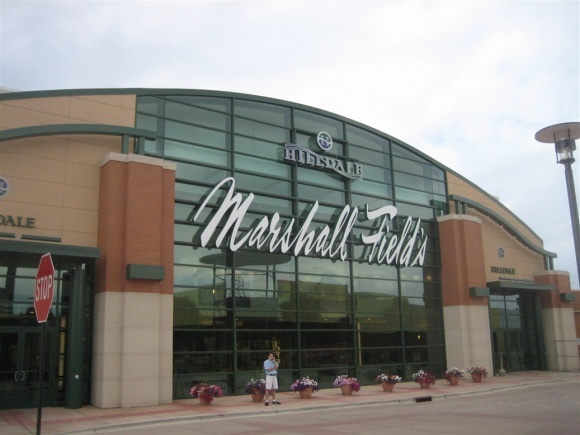 In 1988, Field’s scaled back their Wisconsin presence, giving several Milwaukee-area stores to Green Bay-based Prange’s, because the upscale Marshall Field’s felt those locations were a better fit for a mid-level store like Prange’s. 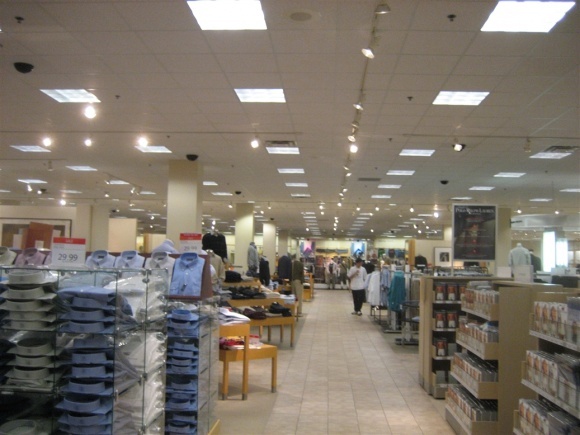 After all, Gimbels was more of a mid-level store itself. 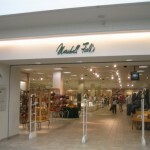 Field’s, however, was pleased with sales at Hilldale and kept that store running – as well as two others in Milwaukee. 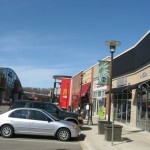 It was a better fit for Hilldale’s demographic, too, as the neighborhoods on the near west side of Madison are some of the most affluent in the area. 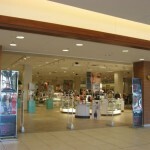 During the 1990s, Hilldale soldiered along, all the while holding its own against larger, more traditional competitors East and West Towne. 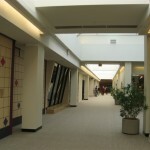 In 1997, Hilldale renovated again, carpeting the floor and giving it a spruced up 90s look. 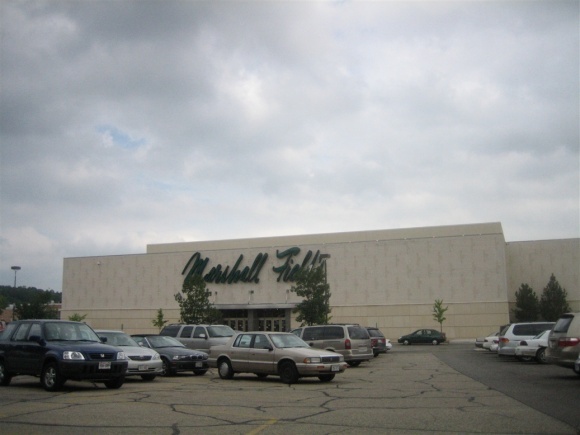 In 2000, Chicago commercial real estate developer Joseph Freed literally showed up one day in front of Marshall Field’s and approached the mall’s manager, Tom McCann, and asked him to lunch. 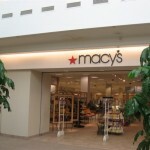 Over lunch, Freed told McCann of his intentions to purchase the mall. 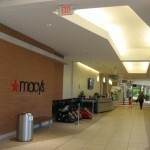 McCann told Freed the mall was not for sale, that the University was happy with it, and instead invited Freed to apply to be the Hilldale’s management company instead. 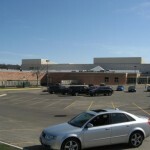 He did, but the management contract ended up going to Corrigan Properties instead, and the two parted ways for the time being; however, this meeting ignited a spark for the chain of events that would bring Hilldale into the present. The next few years proved to be pivotal for Hilldale, as it rode the roller coaster from the brink of downturn to the precipice of reinvestment. 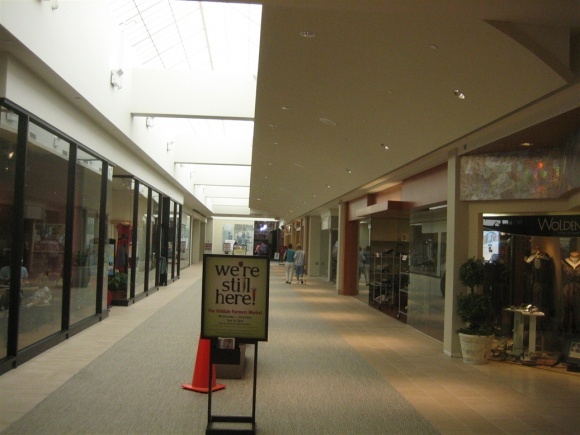 In 2004, the vacancy rate at long-venerable Hilldale started to rise, as fortunes of small enclosed malls like it fell nationwide. 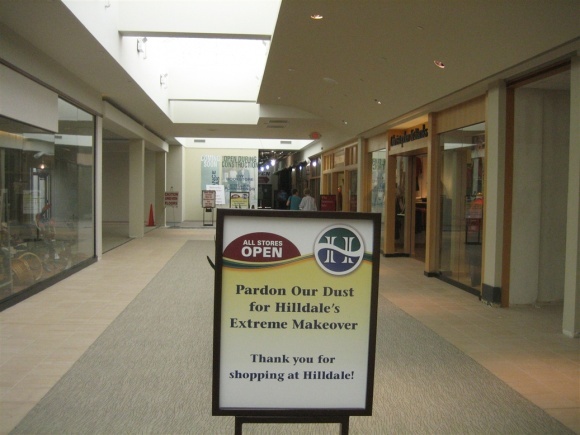 Competition as well as changing consumer preferences away from local boutiques to national chains added to Hilldale’s woes. 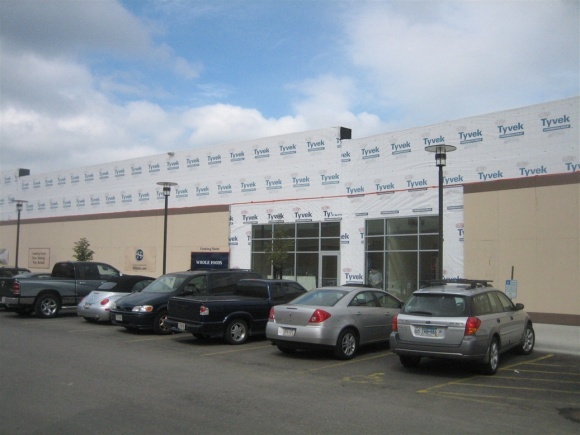 The center wasn’t in dire straits yet, though, and proactive local management combined with several very interested private parties helped Hilldale innovate and reposition. 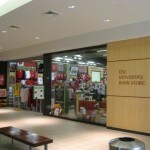 In February 2004, the University decided to sell Hilldale to the highest bidder, which turned out to be Joseph Freed. 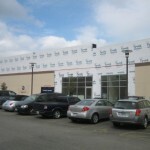 His unwavering commitment to the site’s procurement was apparent, as his company was the only one willing to pay Hilldale’s full asking price. 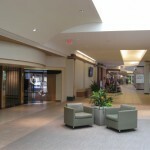 Freed and Associates immediately took Hilldale to task, and proposed the biggest expansion and renovation in the center’s history. 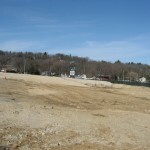 Phase I of the project commenced right away. 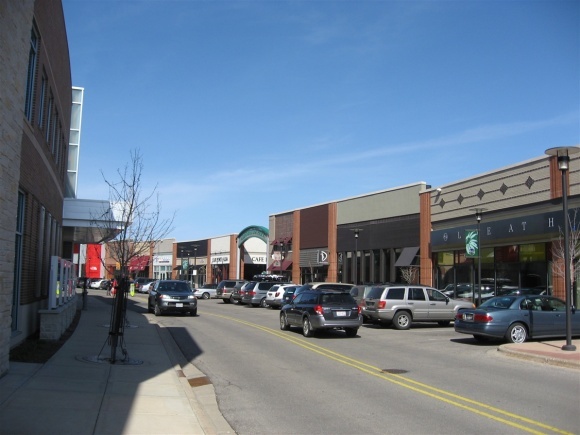 It involved removing the front parking lot and adding 75,000 square feet of streetscape shopping directly in front of the 347,000 square foot existing enclosed mall, paralleling it. 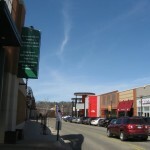 To replace the parking, two large parking structures were built behind the streetscape shops, and a row of 40 townhouses were constructed behind that, facing Midvale Boulevard. 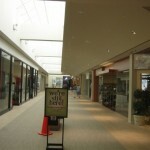 Phase I was completed in 2007. 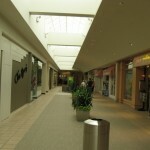 However, the outdoor streetscape portion of the mall is still not fully leased as of 2010, due to the economy and the fact that Joseph Freed has apparently become insolvent – more on this in a little bit. 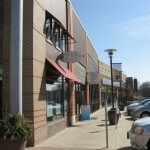 Regardless, the development has been mostly considered a success and definitely saved Hilldale from becoming history. 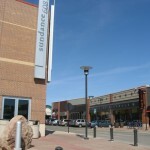 A major addition to the mall occurred with the early 2007 opening of Sundance 608, a multi-screen theater/cafe/bar complex and the first location of the Sundance branded conceptualized by Robert Redford. The bar space above the theater is actually pretty cool, and features nooks with comfy seating and windows into the movie theater. You can grab drinks and look down into the theater and actually watch the movies, just don’t expect to hear them without actually paying for a ticket – no sound is piped in to the bar. 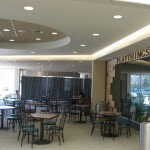 The theater is a significant improvement over the mediocre Upstairs Downstairs restaurant which flanked the south end of the mall from 1985 to 2005. 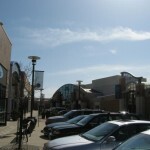 The outdoor portion of the mall is split into north and south sections, which are themselves split by the main entry from Midvale Boulevard. 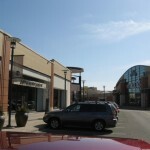 The space in between the outdoor part of the mall and the enclosed mall is a two-way street with vehicular traffic, and perpendicular parking stalls exist in front of all the outside stores. 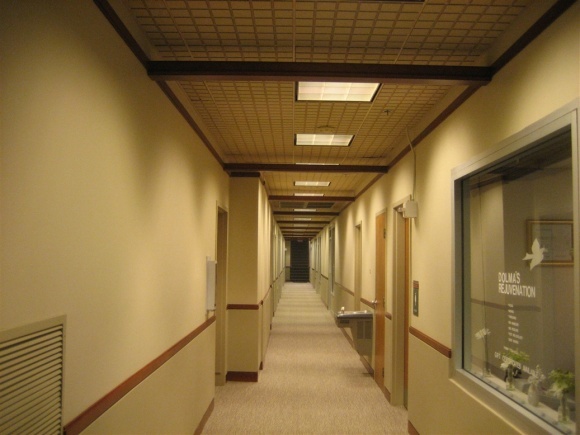 The south section is more fully tenanted than the north, which has several vacancies. 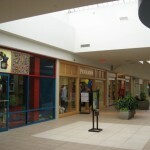 The north section currently contains Pasqual’s, a local New Mexican food chain, Anthropologie, L’Occitane en Provence, and Title Nine, a women’s athletic clothing retailer. 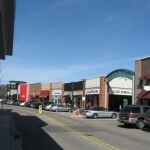 The south section contains more tenants, including North Face, David Bacco chocolates, Sushi Muramoto, Fair Indigo – a fair trade family clothier, FlatTop Grill, Cafe Porta Alba, a US Cellular store, a salon, and the third location of The Great Dane Brewpub. 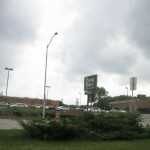 The northeast corner of the property also has chain steakhouse Fleming’s. 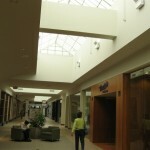 Regarding the interior portion of Hilldale, all of it was retained in the renovation with minor tweaks. 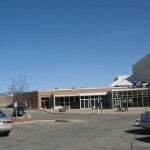 The south end funnels patrons into the Sundance theater rather than the exit that was there before, and the University Book Store there also renovated and expanded, adding a basement level. 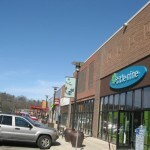 Longtime local tenants Wolff Kubly and The Chocolate Shoppe were ousted during renovations, which was an example of Freed’s lack of understanding in what makes Hilldale uniquely Madison – the local stores. A Ben and Jerry’s was brought in to replace the Chocolate Shoppe space, but in true karmic retribution it failed within a year. 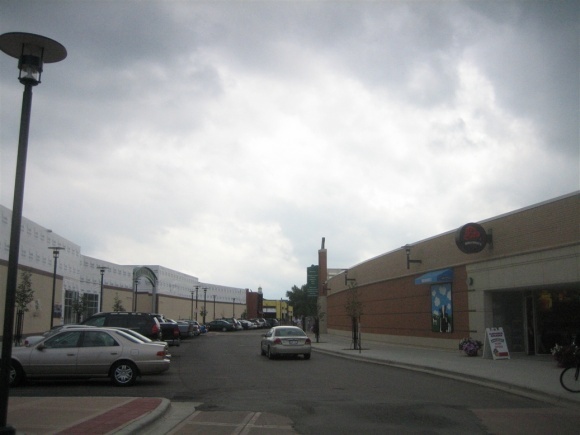 Some even resent the chain-ification of Hilldale, not wanting it to turn into the generic Towne malls or samey strip malls on the far west side. 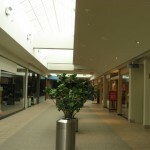 Like the exterior open air streetscape, the interior portion of the mall has also struggled with its share of vacancies, but by no means is it troubled or dead. 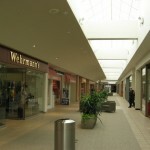 Many local retailers like Wehrmann’s Travel Shop, Morgan’s Shoes, Jan Byce’s, Therese Zache Designs, Playthings toy store and Ulla Eyewear coexist with regional retailers like Fannie May Candies, Buddy Squirrel and national chains like Pendleton, Bath and Body Works, and Christopher and Banks. 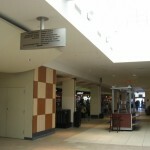 In recent years, a small food court popped up on the west side of the mall near the west entrance. 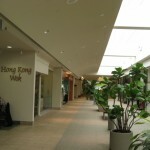 At its height it had Quizno’s, Hong Kong Wok, and Rocky Rococo, but currently only Quizno’s remains – Hong Kong Wok moved to a different part of the mall and Rocky Rococo closed. I have no idea what the long term plans are for this space, but it seemed to be a popular lunch spot and viable in spite of the myriad of food options in this area. 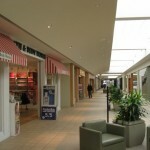 The design of the mall’s interior is based on the main hallway, which runs from north to south from Metcalfe’s Market, past the front of the department store anchor, terminating at the theater. 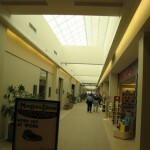 A small side hallway passes to the north of the department store, connecting the main hallway to the back of the mall, where a small food court exists. 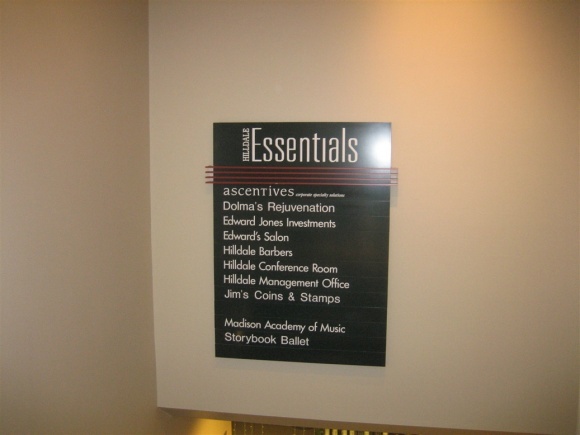 In addition, a small basement level housing a Ballet school, Madison Academy of Music, Hilldale Barber, Edward’s Salon, a Coin and Stamp shop, and management offices. 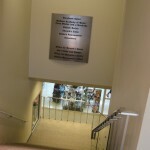 The basement level has its own dedicated entrance to the north parking lot, via a long stairway, and has been at the mall as long as I can remember. 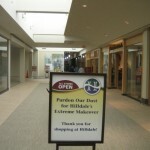 During the middle of renovation, Hilldale’s center court was remodeled with a large, swooping, modern glass facade, which welcomes shoppers as a focal point from the main entrance off Midvale Boulevard. 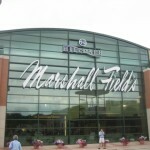 This facade was fitted with a gigantic Marshall Fields sign, which was only up for a few weeks (or less?) 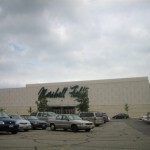 before Marshall Fields fell to Macy’s in September 2006. Whoops. 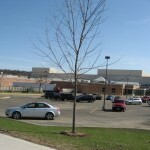 Following the completion of Hilldale’s renovation and expansion, Phase II of the project began in 2007. 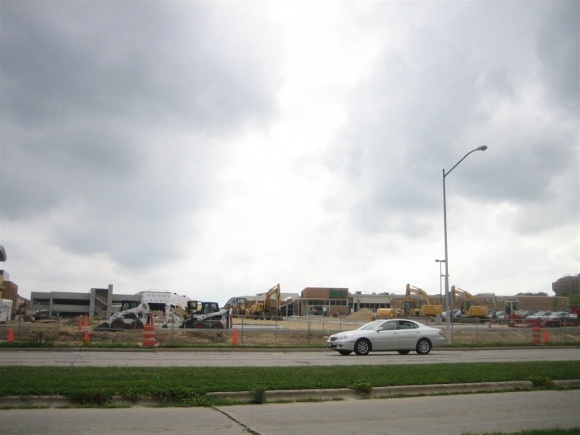 This project involved the demolition of a large office building, movie theater and Chinese restaurant to the west of the mall. 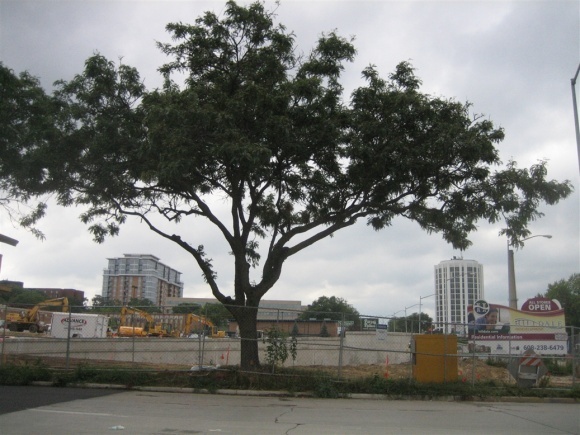 Originally, this site was to become a Whole Foods Market, a condominium tower, and a hotel. 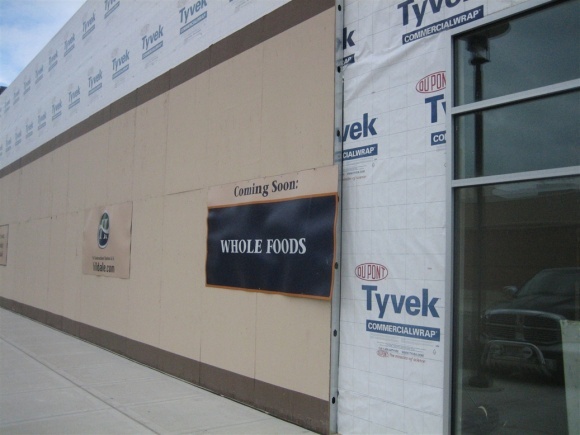 Sentry, who also operates an upscale grocery store anchoring the north end of the mall, rightfully threw a fit about the proposed Whole Foods. 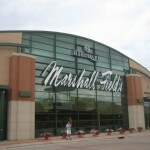 What mall has two grocery stores? Who thought this was a good idea? 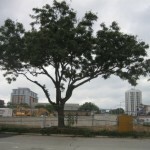 However, the project has been delayed due to the economy, and as of early Spring 2010 is still a gaping hole in the ground – but at least now it’s a gaping hole with a solid plan. 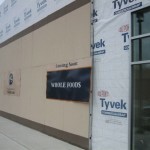 Whole Foods pulled out in October 2008, citing the economic downturn, and after hunting for tenants, Freed announced they had landed what will become the Madison area’s fifth Target store in Summer 2009. Target sailed through the permitting process, which is a rarity for businesses who attempt to deal with the city of Madison. This should tell you how bad they wanted something here – even notoriously NIMBY local residents did not emit a peep of dissent or concern with Target’s plans during meetings. 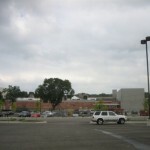 Target plans to break ground sometime in Spring/Summer 2010, with a Spring or Summer 2011 opening. Meanwhile, plans for the residential components of Phase II turned to dust, and I haven’t seen mention of the hotel anywhere lately. Hotel, what hotel? 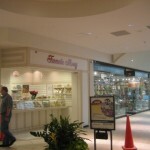 Most recently, Hilldale has again become subject to legal wrangling as its owner, Freed, apparently ran out of money. 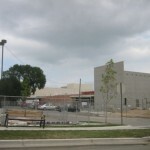 In late 2009, Freed stopped making payments on its loan for a major project in downtown Chicago, which has since been placed into receivership. 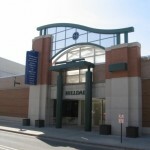 Then, in February 2010, Freed stopped making payments on Hilldale. 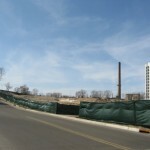 However, Hilldale was not placed into receivership because a Circuit Judge decided that it wouldn’t be in the best interest of the $175 million redevelopment to change landlords at this late stage of the game. In addition, Freed skipped out on the obligation to pay their taxes, owing almost a million dollars to the city. Unless Freed comes up with a lot of cash soon and emerges from their problems, look for a new owner eventually. I have trepidation for new ownership though, because it could mean bad management from a remote owner. Even with the slow pace and all of Freed’s troubles, their persistent commitment to Hilldale is at least a sign that they might really care. 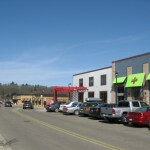 Hilldale’s reinvigoration represents a good infill investment in a great location which had been underutilized for years. It’s really too bad the economy is in the toilet, making the process of expansion a lot longer and more arduous than it would have been in more prosperous times. 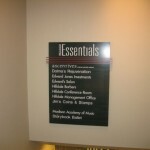 I wonder how many of the current vacancies are really due to complete lack of interest, or Freed’s inability to market the appropriately market the center due to their own financial problems. 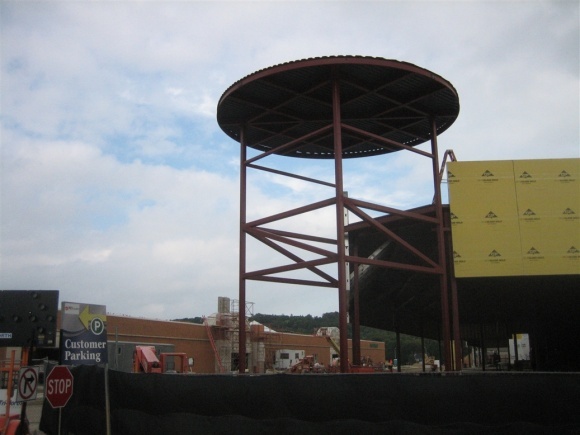 At any rate, progress has been made, albeit slowly, giving Hilldale the framework to succeed in the future. 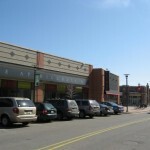 Hilldale remains true to Madison as an institution of local and national retailers, with an unusual emphasis on local, because that’s what has endeared Madisonians here for almost five decades. 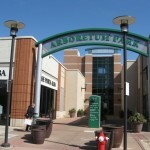 What mall has two grocery stores? 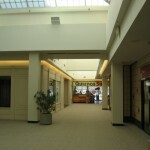 Broadway Mall used to have 2 when it was open air. 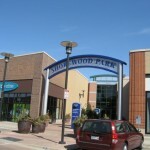 Funny, I lived not far from Madtown for many years and never even heard of this place. Local, indeed! 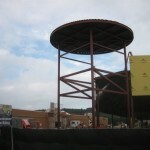 Those tower elements look like giant tables to me. I used to bus tables at Upstairs Downstairs while in high school. 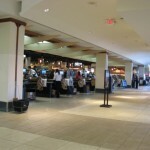 There was a Little Caesar’s pizza at the other end next to Sentry where you could dine in. 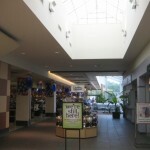 I remember a Walgreen’s also. 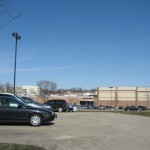 There indeed WAS a Walgreen’s, on the North side (I worked in photo there in their last years). It was previously a Rennebohms, which we took over sometime in the 80s as I was told. 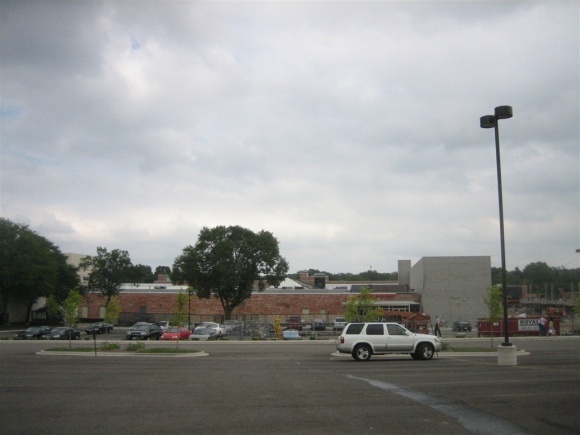 (Walgreens moved across University Avenue when they tore down the grocery store/Rocky Rococcos/laundry and the freestanding Subway there, making room for Walgreens, a grocery chain –Copps?– and a two story Border’s.) 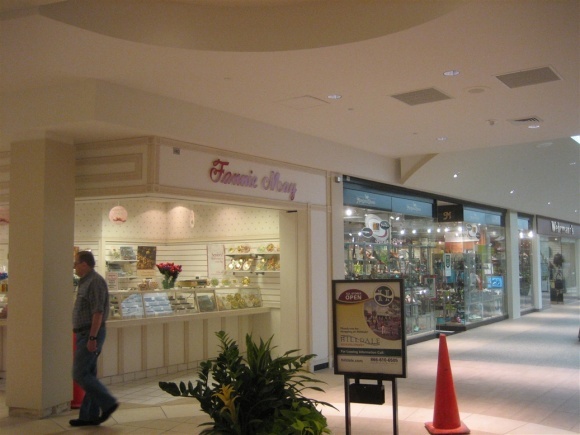 I remember the south part of the mall had the aforementioned Upstairs/Downstairs on one side and the University Book Store on the other, and then an Ace hardware store, both of which had separate entryways in the backs of the store. The hardware store closed a bit before Walgreens moved, but there was a clock/watch repair part of the store which continued to operate, using only the front 10% of so of the area (and disusing the rear entrance.) 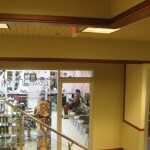 The pharmacy that replaced Walgreens also utilized but a fraction of the store’s square footage. I also remember there was a copy shop (Bob’s Copy Shop?) 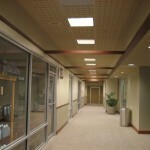 in the basement area. 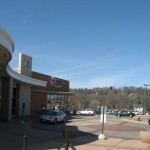 I remember the Sam Goody that was in the mall used to be the storefront directly to the left of Walgreen’s and was TINY. Then a clothing store closed, and they moved directly across Walgreen’s in a much bigger storefront, and I seem to remember they had an overabundance of classical shelfspace (Hilldale at the time had a reputation as an old people’s mall, so I guess it makes sense.) 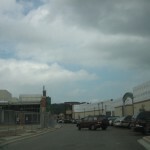 But they folded up along with all the other Sam Goody/Musiclands around the turn of the millenium. 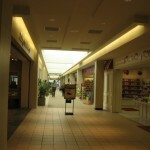 I have many many memories of wandering the mall, getting my lunch at Quizno’s or at the baked chicken at Sentry’s. I’m a bit surprised hearing the prosposed wooing of Whole Foods — there was a Whole Foods not four blocks down University Ave. which thrives, albeit with really convoluted parking. The Target is coming along nicely and should be open soon, but I’m not sure it will drive any more traffic to the mall since you will have to walk across a street and some parking lot to get from one to the other. But at least they’re building something there. I think the hotel/residential second phase is completely dead, although there was an unrelated proposal for low-income, senior-oriented apartments in the area. 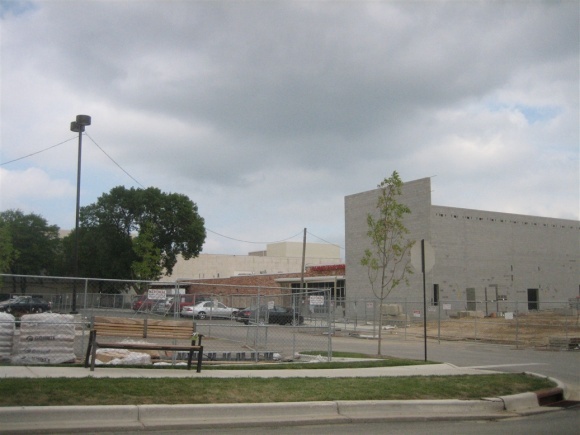 Also of note was a development about a mile to the west, at University and Whitney. It would have featured health care and hotels along a fake “main street”, but it got canned for having too much surface parking. 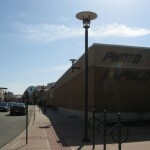 Shame, because that stretch of University Avenue could use a facelift. 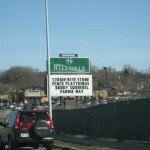 As for Hilldale itself, it’s not much of a destination unless you’re shopping for women’s apparel. I went shopping for Christmas presents there and the choices were quite limited. 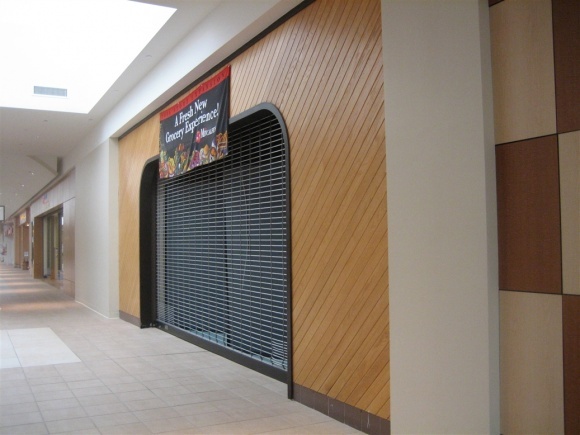 The Quizno’s seems to be holding up well but that little wing of the mall is mostly ignored by shoppers and has seen some turnover. 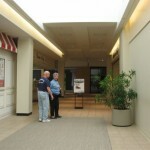 The “lifestyle center” section is bustling though. 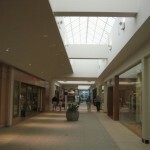 Overall, the mall is in better shape than it was a decade ago (when the future was looking bleak) but already losing luster. 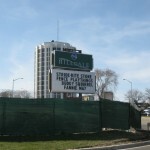 I liked the old Hilldale before it was entombed by concrete and condos. 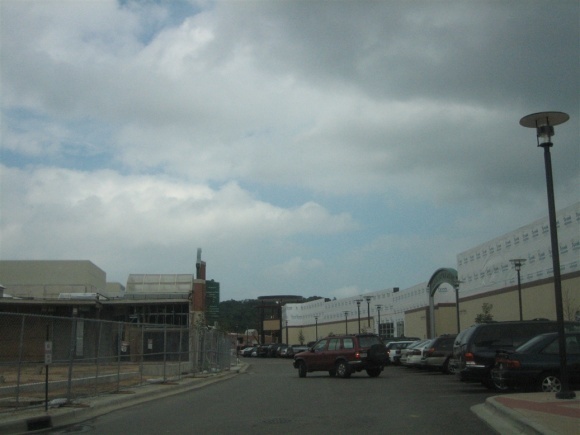 It used to have a parking lot out front that was handy for people called “shoppers” who drove there in things called “cars.” You could see the sky from the mall. 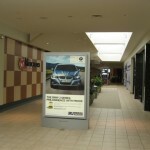 You could eat breakfast at Rennie’s, get something fixed at Wolf-Kubly, and catch a movie at the theater. 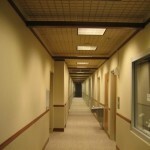 Now, it looks like somebody surrounded the place with an East German prison block. It’s cold, unfriendly, and uninviting. 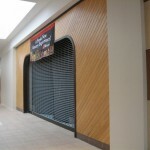 What a shame that Madison lost such a friendly little mall. 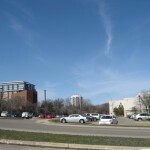 @Dave, parking and vehicle congestion at Hilldale, particularly along the northern and eastern sides of the mall, has become such a problem, especially since Target opened. 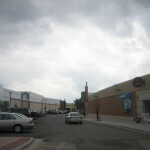 It’s especially difficult trying to find parking near Metcalfe’s. 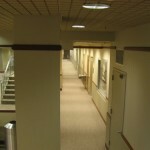 There are a few of us from back in the day that know where the hidden tunnel entrances are. Buried deep below the shopping center, the cold war was very much alive at the time. An interesting history and as a fellow Madison resident I learned a lot here. A caveat to people reading this who may be inclined to think that a Sundance Cinema would be a cool thing to have in their community. Madison had a strong & thriving independent film community before Sundance came. Theatres in the city that played independent movies included Westgate, Hilldale, the Majestic, the Orpheum and the Esquire. Some of these theatres had some issues with the age of the property and equipment; The Majestic, easily Madison’s flagship of independent and foreign cinema, was also home to the worst seat and sound system in the city. I would often have to shut my eyes and concentrate on the sound to try to understand the dialogue coming from their badly in need of retirement sound system. Almost all of these entities are defunct now or have changed in significant ways and Sundance is the only game in town for independent and foreign film. The ticket prices are higher than any theatre I have been to and a maintenance fee is added on to each ticket, presumably to offset the costs of the leather furniture and internet access offered. The cost is so high that I now chose to just buy the movie from Amazon when it is released, depending on the price it sometimes runs less than what it would have cost me to see the film at the Sundance theatre (!). I like to see movies in the theatres but when the cost of admission becomes absurd I vote with my wallet. 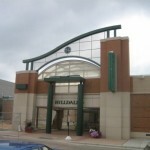 I was a grad student at UW in the late 1980s, and one of my favorite places to shop, browse & eat was Hilldale mall. 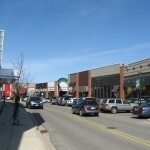 Compared to the other malls in the Madison area, Hilldale then was smaller and more manageable, besides being the closest mall to the UW campus. 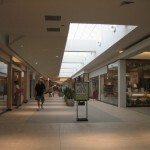 I could walk around the whole mall in less than an hour. 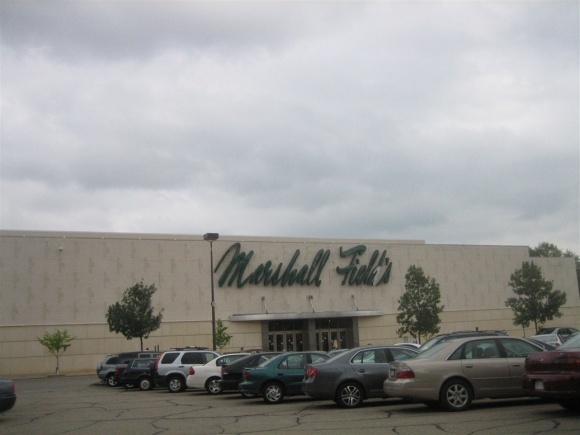 I used to shop for groceries at Sentry, browse books at the University bookstore, buy birthday cards for my many relatives at the Hallmark store, and eat at the restaurant inside Marshall Field’s. 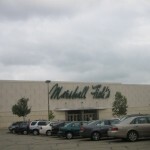 Hilldale mall wasn’t as crowded as the other malls in the Madison area, and so shopping there was actually quite relaxing for someone like me who was working on a Master’s thesis and often felt stressed out by graduate school work. 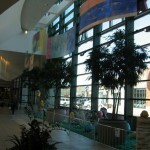 If I may add, I remember visiting Hilldale, post-1997 renovation (in July 2002 to be exact. 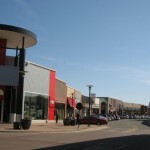 My first visit presented me with a very decent, and thriving (for the most part) shopping center that had a inviting environment, warm lighting and carpeted corridors, and the shops weren’t all entirely ‘upscale’….there was a decent mix of shops..local and regional. I’m not shocked about the plans to make it mostly open-air again. This is unfortunately the trend nowadays. 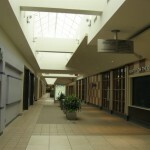 I’ve read a bunch of these articles about dead malls online in recent weeks and most people are basically saying ‘good riddance’. Are these folks that grew up in the 80’s saying such things? I grew up in that era (albeit, not a teenager, but still…..), and we embraced these places. It’s a shame, but it’s inevitable. 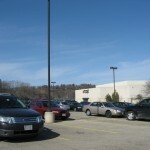 The parking is the big reason I haven’t been to this mall since its huge overhaul. 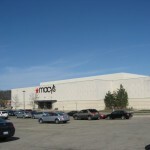 When UW-Madison ran this ship, it was in better hands, IMHO, but considering where the whole ‘enclosed mall’ thing is going, I’m not surprised in the least that the ball was tossed to other owners, who have frankly, ran this mall into the ground. 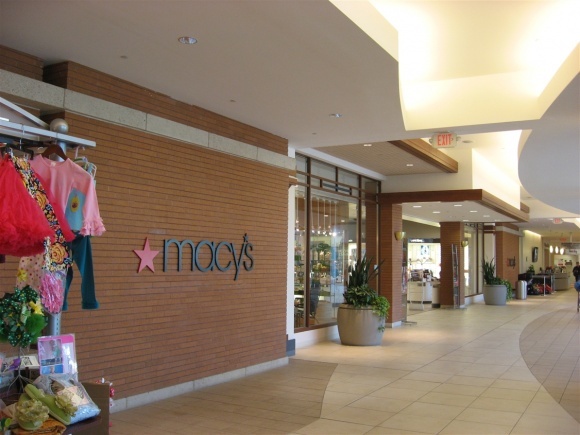 Madison, Wis. – WS Development-owned Hilldale, a 675,000-square-foot center in Madison anchored by Macy’s, Target and Sundance Cinemas, will soon begin redevelopment to include 53,000 square feet of new retail and restaurant space. 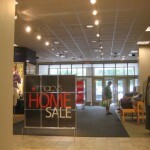 Tenants that will join the center include Kate Spade New York, Lucky Brand, Michael Kors and Sperry Top-Sider. 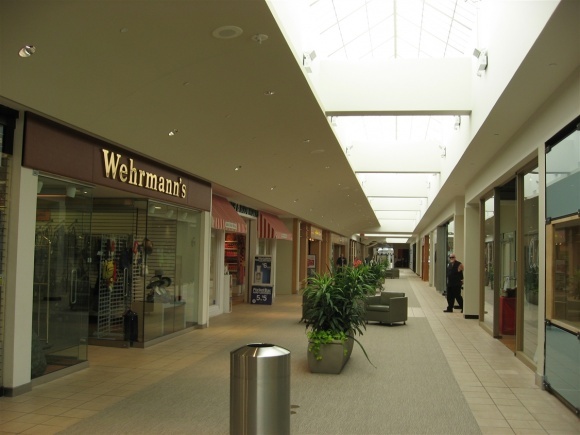 WS Development’s plan will take the existing enclosed mall area between Metcalfe’s Market and Macy’s and create an open-air streetscape. 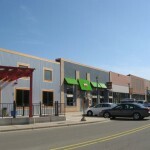 The plan will deliver outward-facing storefronts along the existing streets in this area and add an open-air connection through a pedestrian walkway to the west parking lot with additional storefronts, patio dining and landscaping. Does anyone remember the disco bar by the movie theatre (basically near the present-day Target). What was the name of it. It had a car, maybe a cadillac in front of it. Marbles?